penetrated and enriched our lexicon. For example, McNairn relates that a “soccer mom” refers to “the stereotypical middle-class suburban mother with school-age children.” Incidentally, this term was the American Dialect Society word of the year in 1995. In colder climes, this lady can do double duty as a hockey mom. Another new term is “moneyball.” It came into our lexicon as a result of Michael Lewis’ 2003 book Moneyball: The Art of Winning an Unfair Game that was turned into the 2011 film Moneyball starring Brad Pitt. In baseball, this term refers to strategies by managers that rely on a sophisticated analysis of player statistics. Before long it was adopted in business theory to refer to an ongoing investigation of past performance by data analysis to help plan for the future. Most books that are compendiums of words that fit into specific genres merely list terms in alphabetical order. 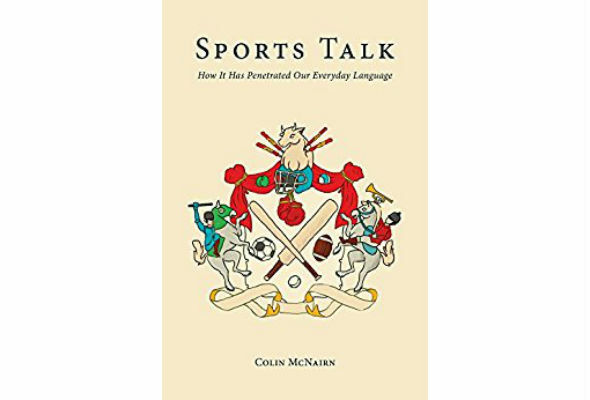 What I enjoyed about McNairn’s book is that he analyzes terms in chapters dedicated to particular sports thus allowing us to see patterns that explain why certain fields have a predilection for the metaphorical use of terms from particular sports. Sports Talk provides other examples that imply that politics is merely a slightly less violent version of football. For example, a “Hail Mary” pass in football is one with low probability of success and is therefore only attempted in dire circumstances, such as the last play of the game. But if football terms are the preferred vehicle to describe events in the political arena, baseball metaphors reign supreme in sexual domains. Some years ago I attended a lecture in Montreal by Israeli novelist A.B. Yehoshua in which he explained that national literatures exhibit particular motifs and that the crux of American literature is the pursuit of the American Dream— success, and we see many terms in baseball that relate to success or failure in the sexual arena. McNairn relates that “a man who tries to… seduce a woman runs the risk of ‘striking out’ and that it’s worse if you strike out ‘swinging’ rather than ‘looking’ (not swinging) because the former implies you gave it your best effort and still failed.” And as is well-known, the base a man reaches highlights his level of success. First base=kissing, second base=moderate fondling, third base=extreme fondling with the ultimate goal being of hitting a home run, i.e, scoring. Still other baseball terms relate to sexual preference rather than success. In baseball, a switch hitter is one who can bat from either side of the plate, in sexual terms this person is bisexual. Someone who “plays for the other team” is gay. One minor quibble I have with Sports Talk, however is that it gives short shrift to two hockey terms that have penetrated political dialogue in Canada. Interestingly, both of the terms relate to evasion. For example in the 1990s, in an exchange in the British Columbia Legislative Assembly, Liberal member Rich Coleman said of NDP Minister Moe Sihota that, “When the Minister was referring earlier to being a skier, he should have been a skater and learned how to skate around an issue rather than answer the question.” Also in the 1990s, CNEWS stated that “Bernard Landry was performing a Bouchardian spinarama on the inevitable question about sovereignty referendum strategy.” A spinarama in hockey refers to an evasive 360-degree turn. All in all, Sports Talk is a must read for the sports fan. Be the first to comment on "Book review: A penetrating look at Sports Talk and how it’s enriched our lexicon"